Our world is composed of many different races, nations, political affiliations, religious affiliations, and philosophical perspectives; but, despite our differences, we all share the transcendent desire to be healthy & happy and live in a healthy & happy world. Wholistic Health & Happiness is possible! 1) All parts of space can be viewed as both an individual part of a larger system as well as a collective system of smaller individual parts. Ultimately, all of space is revealed to be one infinitely large system made up of infinitely small parts. APPLICATION: On a practical level, this naturally suggests that an ideal guiding perspective is one that balances the importance of the well-being of the individuals with the importance of the well-being of the collectives. 2) All events of time can be viewed as both a result of an infinity of causes as well as a partial cause for an infinity of effects. Ultimately, all of time is revealed to be one eternal chain of causes and effects. 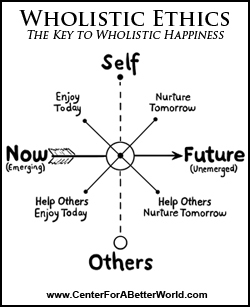 APPLICATION: On a practical level, this naturally suggests that an ideal guiding perspective is one that balances the importance of appreciating present well-being with the importance of nurturing future well-being. This wisdom naturally provides an objective, scientific, spiritual, and universal system of ethics which suggests that an unbalanced (in the terms outlined above) expenditure of time, money, and all other resources that favors any of the above aspects of our infinite and eternal existence, especially at the expense of any of the others, is not preferred (aka "wrong"), as it is harmful (aka "evil"); while a balanced expenditure of time, money, and all other resources is preferred (aka "right"), as it is helpful (aka "good"). In other words, that which is "right" or "good" is that which leads to greater well-being, while that which is "wrong" or "evil" is that which leads to lesser well-being; but the critical key to accurate judgement is the recognition that, ultimately, we are one infinite and eternal entity and, therefore, our well-being is the natural result of successfully balancing our sense of priority between the dynamics of space(individual/self and collective/others) and time (now and future). This simple, sensible, and powerful system of ethics is called "Wholistic Ethics". Using this universal system of ethics as our moral compass, we can easily discern the difference between that which is helpful and that which is harmful to the well-being of our world as a whole and, ultimately, unite around sound judgements and plans of action regardless of our spiritual, political, national, or racial affiliations. Under these conditions, we can move swiftly from a dying world to a thriving world. PLEASE SHARE THIS DOCUMENT WITH EVERYONE YOU KNOW. Additional note from the author (Soren Sorensen): Many people promote the idea that "good" and "evil" are merely polarized opposites that balance the whole (ultimately suggesting equal desirability); but, in my opinion, this widespread belief is extremely dangerous to our wholistic health and happiness. If you hold this belief, I strongly urge you to seriously consider the proposition that "good" is balance and that "evil" is imbalance. I think you will find this perspective to be very revealing!